Sweden v Russia UEFA Nations League, Kick-Off 7.45pm, Wednesday 20th December. Live on Sky Sports. THE final game in League B Group 2 takes place in Stockholm when Sweden entertain Russia in a crucial fixture to decide who gets promoted into League A. The mathematics are quite simple Sweden need to win to get promoted, any other result then Russia are promoted. Sweden’s home form is poor though with only winning one from the last last seven home games. I think it will be avery tight affair with the last 5 H2H all being Under 2.5 goals. The reverse fixture in Russia was a 0-0 draw. 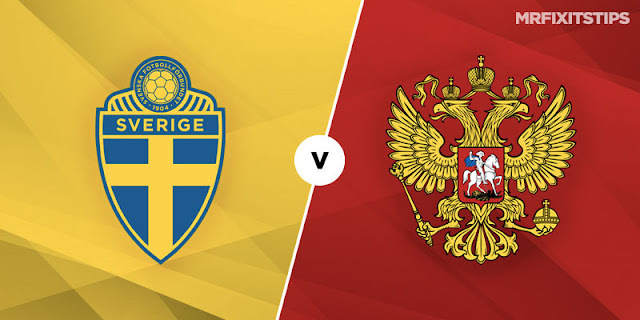 Russia, who are unbeaten in this league so far with two wins (against Turkey) and a home draw with Sweden, will be looking to frustrate the home side and hopefully turn the passionate Swedish crowd to go against their team. However Sweden have kept a clean sheet in all their last eight matches and can possibly do so again and the majority of their games have seen the game open up after the interval with most goals coming in the second half. The reverse fixture in Kaliningrad last month finished goalless but this game could be a dramatic affair. As well as that, Russia have beaten Turkey home and away which leaves them top of the group on 7 points. However, Sweden could still overtake them. Janne Andersson’s side only had one point on the board going into these two fixtures after losing 3-2 at home to Turkey despite being 2-0 in that match. On Saturday, Andreas Granqvist scored the only game of the game from the penalty spot as they won 1-0 at the Konya Büyükşehir Stadium over Turkey. That ensured that Sweden would avoid relegation and it kept alive their chances of promotion. A Sweden win would see them promoted, a draw or a Russia win and they’ll go up.